Another important service we provide is a delivery program for homebound seniors and those who are disabled in our community. We are the only food pantry in Josephine County who has a grocery delivery service for those who have no other way to get access to much needed food. 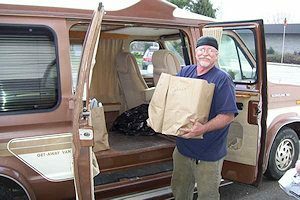 The ROC home delivery program currently delivers around 300 bags of groceries, toiletries, and pet food every month in the Josephine County area. If you know of anyone who needs our help, have them contact the ROC at (541) 476-3344. We are here for those who truly are HOMEBOUND. The ROC does have criteria for signing up with our Home Delivery Service, which includes, but is not limited to some of the following: you need to be living alone or with someone else who also can not drive; you sign a paper that says you no longer drive and have no family, friends or neighbors who are willing to pick up food for you once a week (the plus side of picking up food is that dairy, eggs and meat products can be picked up – plus you choose what you want in your bag and how much); you really need to be homebound – if you are not home on the day you have signed up for deliveries, we cannot leave a bag for you outside, due to food handling rules and regulations. Thank you for your understanding.